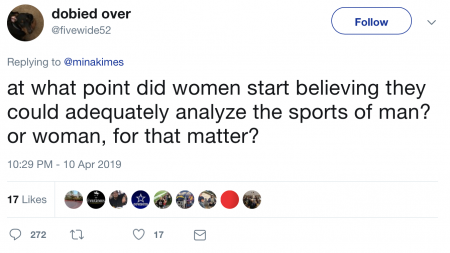 Here’s Mina Kimes, an investigative reporter who specialise in sport (and business) reporting and presents a weekly podcast about American football. … one guy wasn’t impressed. Except women like former Arsenal and England defender Alex Scott earned rave reviews at the last World Cup, and there was naturally no shortage of people ready and willing to put him right. Time to knuckle drag yourself back in that cave….and stop making men look stupid, because right now your picture is next to the definition. The same way we analyze anything – over the sound of bloviating assholes doing a poorer job of it and getting the credit. God, I hope men like him don’t have children. 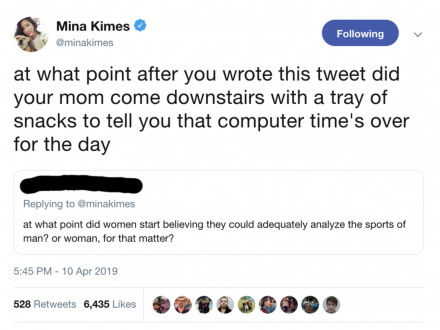 But no-one did it quite so well as Mina Kimes herself, as shared by MyPenLeaksFire on Reddit. At which point he was carried off Twitter on a stretcher.